Tunnel of Fudge cake bakes up tall, with a glossy, brownie-like crust. Break pieces off and eat it; no one will know. I’m wrapping up Chocolate Delight week with a bang: a cake that has a built-in Tunnel of Fudge. The legend of this cake was related to me by Jessica, the author of Pictures of Cake. 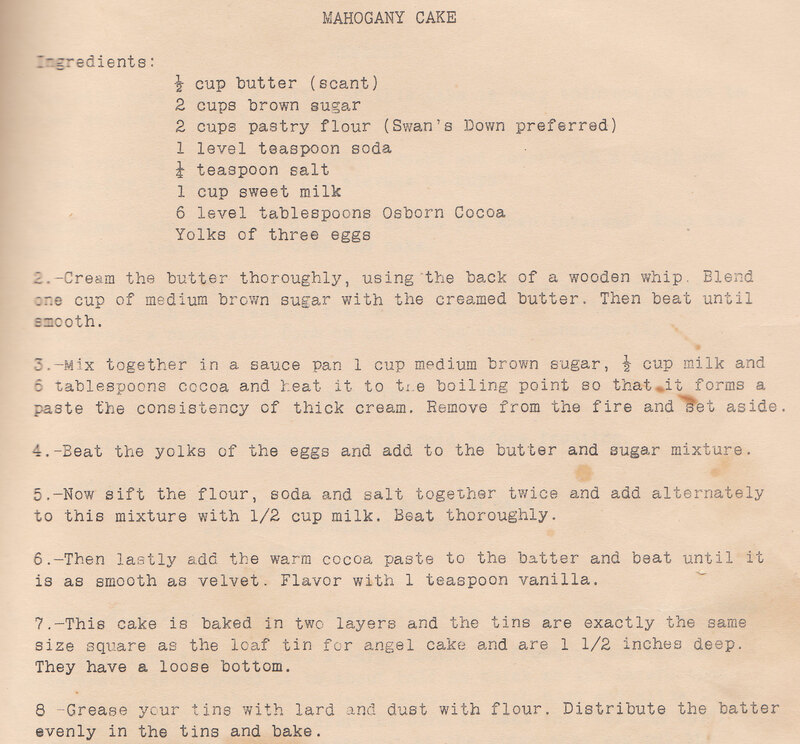 This cake won second place at the 1966 Pillsbury Bake-off, losing to ‘”golden gate snack bread,”‘ a yeast bread made with instant flour, processed cheese spread, dry onion soup mix and butter. (source)” Blech. 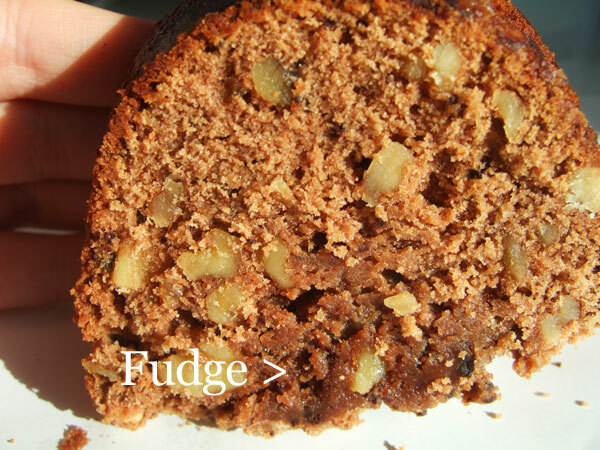 The snack bread has been long forgotten, while Tunnels of Fudge lives on. Third, this cake is quite possible the least healthy thing I have ever made. It contains approximately 60 eggs, 1 millions pounds of butter, and 20 cups of sugar. 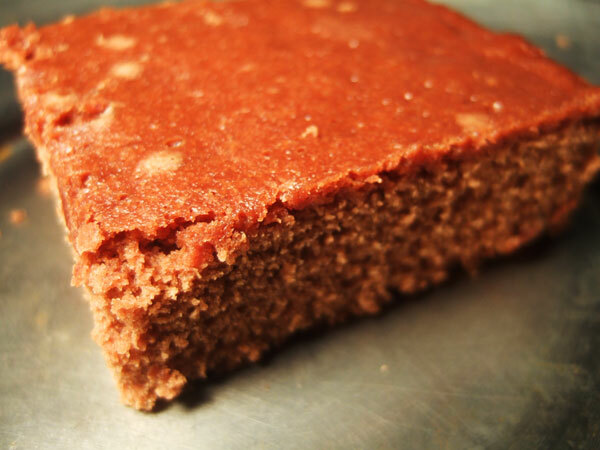 Originally, it was made with a pre-packaged, powdered frosting mix called Double Dutch Fudge Buttercream. Cream butter in large mixer bowl at high speed of mixer. Add eggs, one at a time, beating well after each. Gradually add sugar, continue creaming at high speed until light and fluffy. By hand, stir in flour, frosting mix, and walnuts until well blended. Pour batter into greased Bundt pan or 10-inch Angel Food tube pan. Bake at 350° for 60 to 65 minutes. Cool 2 hours, remove from pan. Cool completely before serving. Note: Walnuts, Double Dutch Fudge Frosting Mix and butter are key to the success of this unusual recipe. 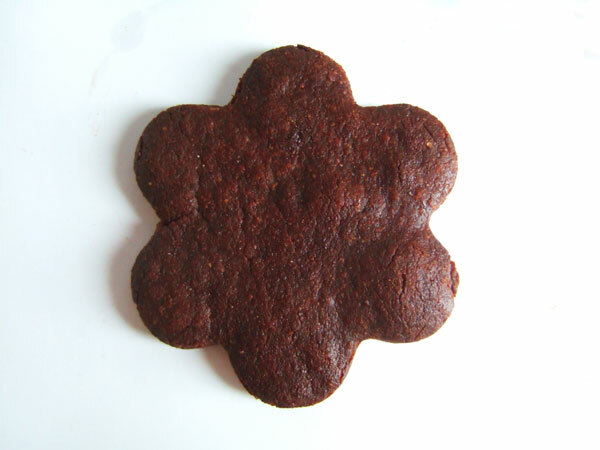 Since cake has a soft fudgy interior, test for doneness after 60 minutes by observing dry, shiny brownie-type crust. After the frosting mix was discontinued, Pillsbury developed a modern recipe which you can find here. This is the recipe I baked from, with a few minor changes that I will include below. 1. Grease a bundt pan and dust with additional cocoa powder. Preheat oven to 350 degrees. 3. Cream together sugar and butter until light and fluffy, about three minutes at medium speed. Add eggs one at a time, mixing thoroughly after each one. 4. With mixer on low, slowly add dry ingredients. Scrape bowl, then mix until combined. 5. With a spatula, fold in walnuts. 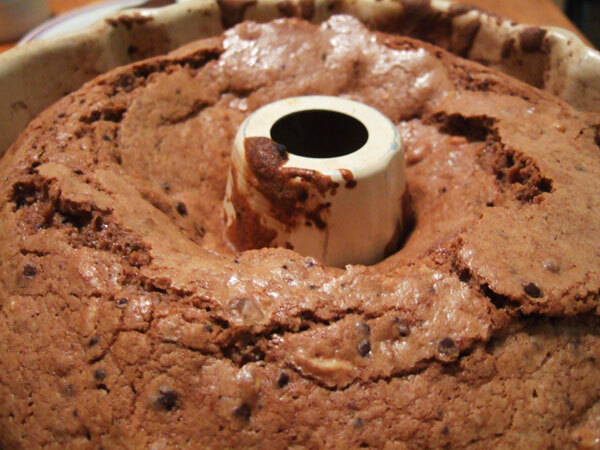 Spoon batter into bundt pan; bake 45 minutes or until top has a dry, shiny brownie-type crust. Cool upright in pan on wire rack 1 1/2 hours. 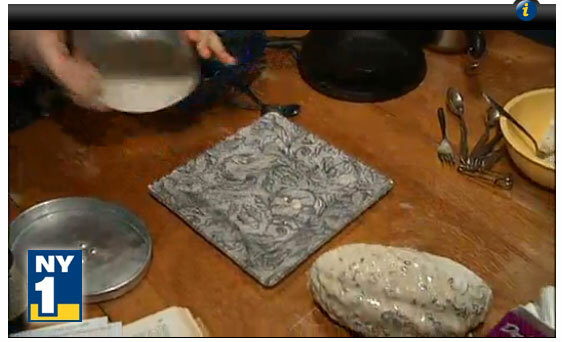 Invert onto serving plate; cool at least 2 hours. Can someone please tell me how to get a cake out of a bundt pan? Mine always comes out in broken, shameful pieces. When I cut my cake, it wasn’t puking out fudge like in the 1966 photo; but, running down the middle was a dense spine of goopy fudgeness. My oven tends to run a little hot, so I think the cake was slightly over-baked: ten minutes less would have allowed a much thicker fudge vein. The cake was good; the walnuts were a nice break from what would have been a total chocolate assault. But the cake also had a greasy mouth-feel thanks to the million pounds of butter. And it’s sooooo swweeeeeet. I even made it with a cup less sugar than the Pillsbury recipe calls for. I don’t know. I’d be curious to have more people give this bizarre chocolate cake a whirl and tell me what you think of the final results. Chocolate Wafer cookies; from Gourmet, February 1950. Intense! 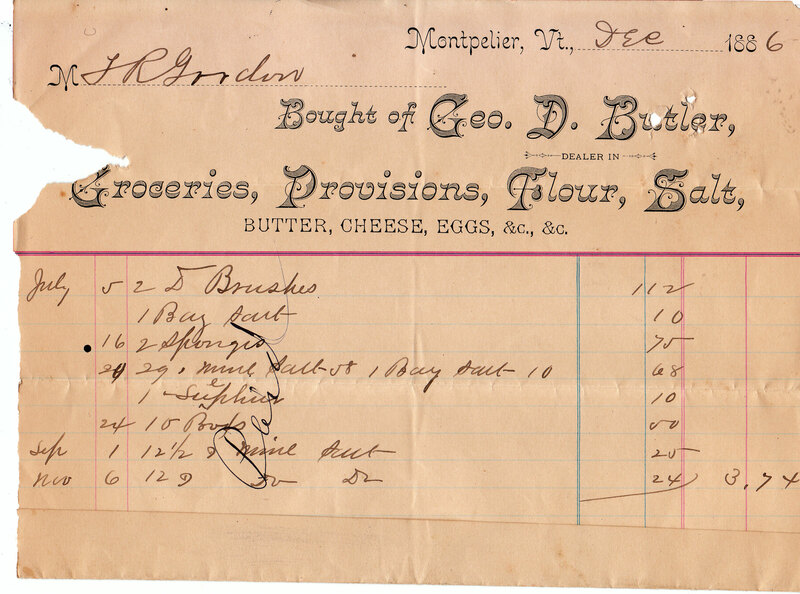 But also inaccurate–chocolate cake recipes didn’t start appearing until the later half of the 19th century. Just FYI. 1. Sift together flour, cocoa, baking powder and salt. Set aside. 2. Cream butter. Add sugar gradually and cream together until light and fluffy. 4. 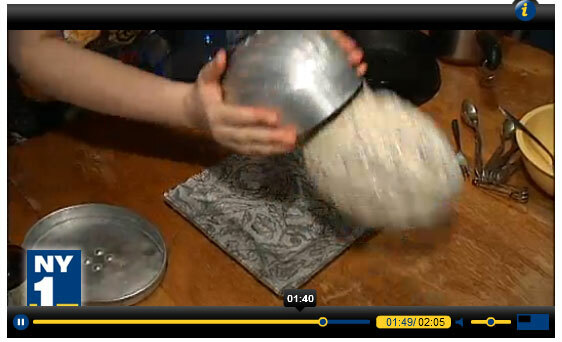 With mixer on low, gradually add dry ingredients, mixing thoroughly after each addition. 5. When completely mixed, refrigerate overnight. 6. Roll out dough 1/8th of an inch thick; cut into fun shapes; bake in a 375 degree oven for 6-8 minutes. This recipes mixes up very quickly, but the dough is hellish to work with. It was somehow both dry and crumbly and extremely sticky. It did allow me to use some of my vintage cookie cutters as well as a vulgar cutter my roommate gave me for Christmas. The cookies are tasty. I liked the texture best when they first came out of the oven: they were really crispy and flaky. They got a little more dense as they cooled, but still very good. If I was going to make an artisanal Oreo, I would use this recipe. These cookies are getting shipped off to Washington DC for a friend’s very belated birthday present. Not the vulgar ones, though. The balls got a little burned. Royal Chocolate in a royal cup. It’s cold in New York. Reaul cold. At the end of a long day, I needed a little pick me up. So I cracked a cookbook my Aunt had given me for my birthday, a 1971 reprint of a 1934 Hershey’s Cookbook. The book has been “adapted to a modern kitchen,” so that could mean anything in terms of reinterpretations of the original recipes. But regardless, I do enjoy cooking up some 70s kitsch. 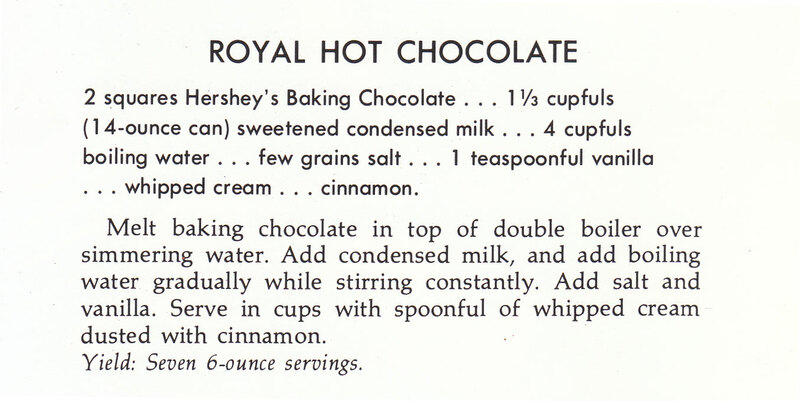 In the “Beverages” section, I came across this recipe for Royal Hot Chocolate. 1. Melt baking chocolate in a double boiler: a glass bowl set over a saucepan of boiling water will do just fine. 2. Add condensed milk, then GRADUALLY add boiling water while whisking vigorously. Heed this advice; I didn’t, and dumped the water in. Despite some vigorous whisking, I ended up with grainy hot chocolate. And the water must be BOILING, or else you’ll end up with a lump of unmelted chocolate and water. 3. Add salt and vanilla, and serve, with whipped cream and a dusting of cinnamon if desired. 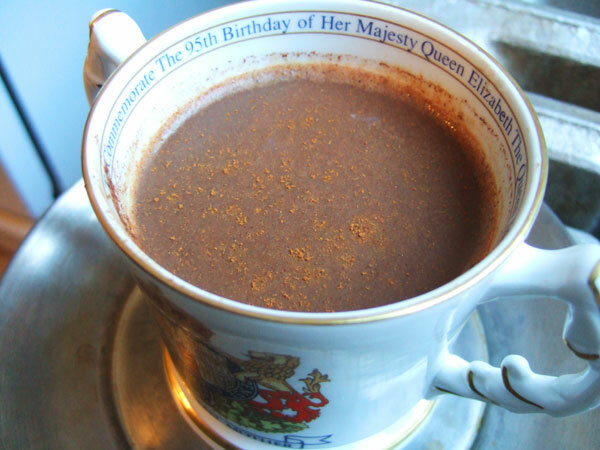 Since it is Royal Hot Chocolate, I served it up in the royalest mug I had: A double-handled cup commemorating the Queen Mum’s 95th birthday. When I first sipped the chocolate, I wasn’t bowled over. But the more I drank, the more I realized how smooth it was. How chocolately. And not too sweet. It was perfect in every way. In a feat of decadence, I drank this hot chocolate while taking a hot shower. I feel Awesome. 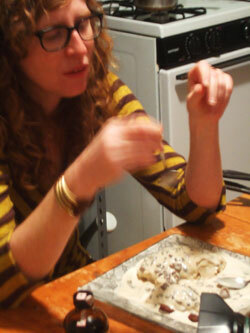 Right: Rachel Wharton and I chowed down on some melty, chestnut ice cream. Coupla weeks ago, I was featured on New York 1 making some chestnut ice cream for Edible Manhattan editor Rachel Wharton. “In planning a dinner, the question is not to whom you owe dinners, but who is most desirable. The success of the dinner depends as much upon the company as the cook. 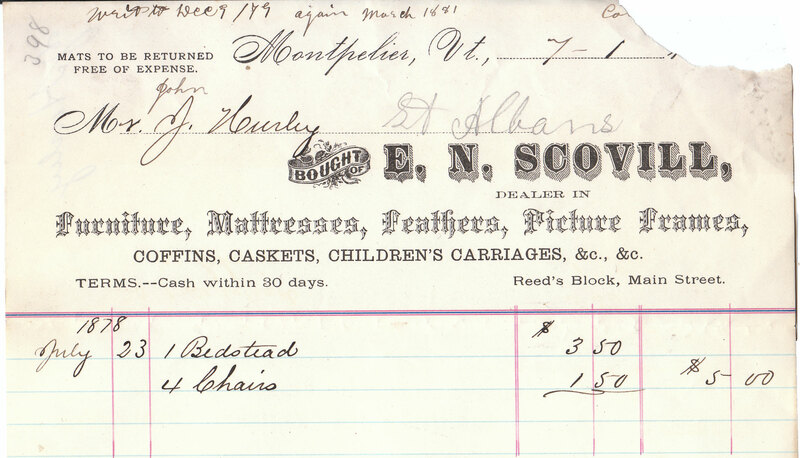 Discordant elements — people invited alphabetically or to pay off debts — are fatal. Sound advice, no? The full chapter is here. 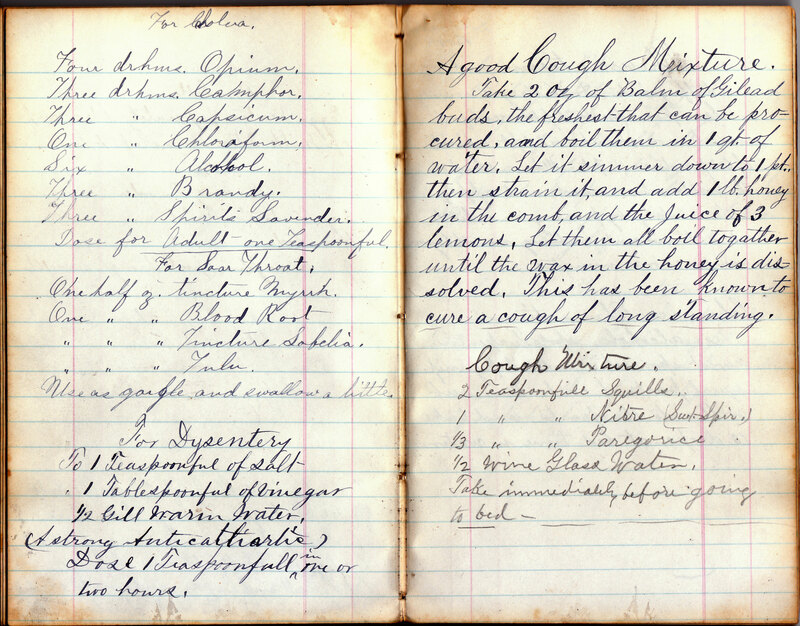 I’d like to throw a dinner party based on his suggested menu; it’s perfect for the winter and classically late 19th-century: it consists of Turtle Soup, Terrapin, Ham Mousse, Roast Turkey, Sweetbreads, Pate in Aspic and Canvasback Ducks. The dessert, Nesselrode Pudding, is an ice cream made with chestnut puree. The recipe requires a lot of steps, but every one is worth it. The result is an incredibly creamy, flavorful ice cream. Miss Corson’s Pratical American Cookery by Juliet Corson, 1886. *You can find chestnuts canned, perhaps in the import aisle of your grocery store. I found a bag of “snacking” chestnuts that were roasted, unshelled and vacuum sealed. Perfect. 1. 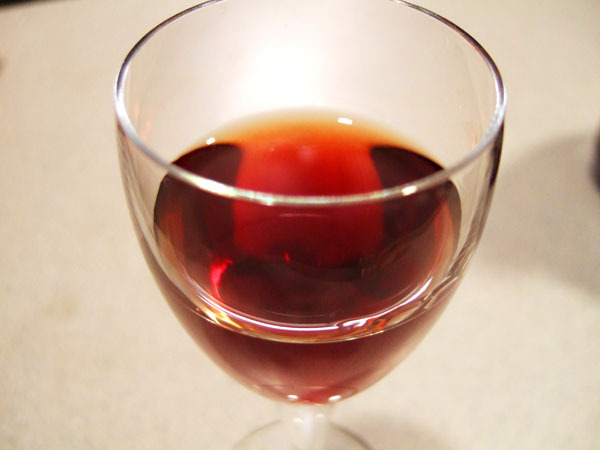 Soak raisins and currents in a bowl with the Maraschino. Set aside. 2. Beat egg yolks with 1/2 cup sugar. Scald the half and half, then add it SLOWLY to the egg yolk mixture, whisking constantly. Pour into a pan and cook on over a very low heat, stirring constantly, until the custard is thick enough to coat the back of a spoon. Remove from heat. 3. Meanwhile, make the chestnut puree: add chestnuts, 1/2 cup sugar, water, and vanilla to a food processor. Puree until smooth, then add to the custard. 4. Add custard mixture to the bowl of an ice cream mixture. Allow to freeze to a soft-serve consistency. 5. Meanwhile, beat heavy cream and remaining 1/2 cup sugar with an electric mixer until stiff. When custard has frozen soft, fold in whipped cream and fruit. 6. Pack into an ice cream mold and place in the freezer overnight, or until frozen hard. I let the ice cream set in the freezer overnight; while shooting for NY1, I busted it out all professional like “Oh, and we have one that’s already done!” It was now time to unmold it: I dipped the outside of the mould into hot water until the outer layer of ice cream melted, then gently turned it upside down on a decorative platter. Simple, right? Not for me. While decanting my ice cream, I managed to fling it across the table, where it collapsed into a sad heap. See it all happen here. Rachel and I managed to scoop the ice cream off of the table and make it presentable, although it totally looked like a brain. Then we gave it the old taste test: although I was repulsed by the texture of the raisins, Rachel and I both agreed this ice cream was delicious. On camera, we took dainty spoonfuls. Off camera, we were shoveling it into our mouth. The ice cream was so creamy and perfectly sweet; the chestnut flavor was interesting, delicious, and subtle. Rachel suggested leaving out the fruit in the next batch and molding the ice cream in individual dishes with a single, candied chestnut to garnish the top. I agree. Hanging out with Rachel is always a treat.